+ It’s exciting to play in this game. They have worked hard to get to this point. + KJ Hill has been pivotal for the offense this year. He does a lot of great things on the field and knows coverages and is aware on his routes. Off the field he is a jokester and a great guy. + Defensively, Northwestern looks stout and strong. Talented zone defense that doesn’t make many mistakes. 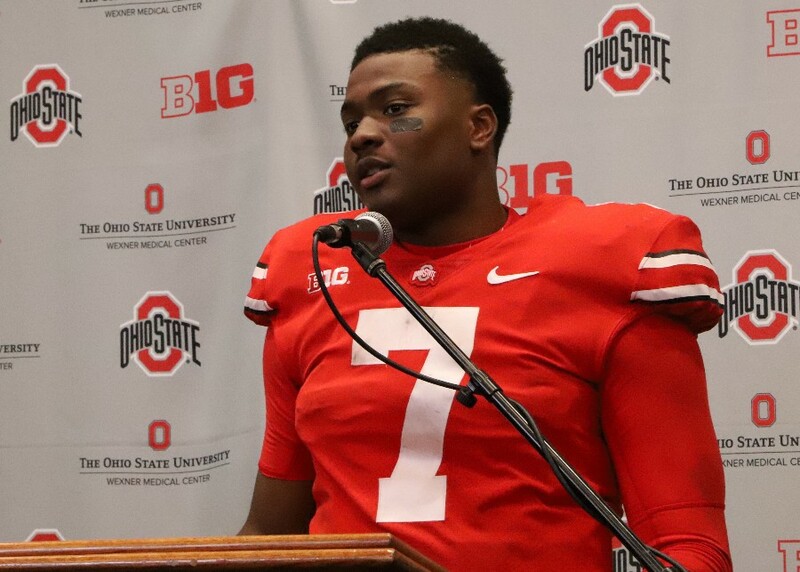 + The biggest thing Haskins has improved on this season is just being a leader on offense and holding everybody responsible. Also, he has gotten better with protections and understanding where everybody needs to be and needs to go. + “Parris Campbell is electrifying. Crazy fast.” He’s a great leader and sets a great example. Great person and a great dad. He is doing a great job for the offense. + Asked about the Maryland game and his development as a leader, he said he has always tried to be a great leader. It’s a process of finding the right ways to be a good leader. Running the ball is one of those ways. That gave the team some energy and a certain vibe and everybody fed off of that at Maryland. + Meyer’s message this week is that Northwestern is a tough team and they won’t back down. Ohio State will need to be at their best once again. They have to have a great week of practice. Haskins’ role as a leader is to make sure that he is on all of his Ps and Qs this week so that he can help the receivers and the offensive linemen. + The individual accomplishments are great, but it shows how hard they worked in the offseason as a receiving group and offensive line unit. The records are nice, but he wants a Big Ten Championship Game. He reflects on Sundays about records that he has broken a little bit, but he has too many other things to take care of to think too much about it. + This is an opportunity to win back-to-back Big Ten Championships, which is an accomplishment given the struggles this season. + It felt like OSU’s offense had an advantage against Michigan. They prepare for Michigan for 365 days every year. “This wasn’t just a week-long process.” Ryan Day and Kevin Wilson told the players they were going to be aggressive. The receivers knew they were going to get man coverage and that it would be an advantage. + Meyer’s message to the team that the Michigan game was great, but it’s over and they have to focus on their next mission. + It’s exciting to be headed back to Indianapolis where he played high school and has been a part of Big Ten Championships. The best way to celebrate his senior season and getting to the championship game is to win it. + “I think it’s very important” to put their best foot forward for the playoff committee. “We just want to build on last week. We have really good momentum going into this game.” Northwestern will present challenges, but they have to focus on what they can control. + Asked to guess on what committee members thought of OSU, he said up until last week they probably doubted their ability to be consistent. “I feel like we’ve shown improvement on all sides of the ball.” Having the game they had against Michigan is a statement and he hopes that win holds weight, but without a win over Northwestern, none of it matters. + “We love Lucas Oil Stadium.” It’s a fast track and the skill players love playing there. + “I am super excited” for the Big Ten Championship Game and he can’t wait to add another monument to his legacy. + The message from Meyer is that this team needs to be an elite warrior. You celebrate a victory, then you have to turn to the next mission. + Before the Michigan game, people were doubting them. Saturday they proved how good they can be. + Northwestern has a good balance between run and pass. They have a really good quarterback and he’s probably the first or second-best QB they have seen this year. + This was the year individually that he wanted to have when he decided to return, but the focus has always been about winning a championship as a team. Things are coming together and the next step is winning a Big Ten Championship. + The linebackers are playing to prove everyone wrong right now. Saturday was one of those games where they shut up the doubters. Northwestern is a team where the penalties could trip up the Buckeyes. Hope they handle that better than they have most of the season. Northwestern is a very well coached team with a lot of smart disciplined players. We cannot TAKE THEM LIGHTLY. They have over achieved and will be loaded for bear against OSU. From the 3rd game of the year leading up to last week this time my stomach was a ball of doubtful hope. The first time since 2004 where I could foresee a lose as much as a win against any opponent on the schedule. THEN the interviews for The Game, and everything changed. The guys were so relaxed, but you could feel the underlying confidence from the leaders like Terry McLaurin, Parris Campbell, Dre’Mont Jones, Davon Hamilton. You had the feeling coming out of those interviews that they “had a secret.” After those interviews I knew they were going to come out Saturday and make a statement. I was conservative in what I was feeling by predicting a 42 – 28 Buckeyes win. Looking back at the level of play, it’s was ridiculously conservative. Having been a Buckeye since 1960 I can tell people that this was a historic performance the 2018 Buckeyes shoveled on top of the forest rats. Pay whatever you have to pay to have a pristine copy of this game to pass down to your next generations. It’s a treasure that will always bring joy. If you haven’t saved Tony Gerdeman’s article from yesterday to your hard drive…………….go do it now, and get it put onto with The Game………people in 100 years will want to relive both. I thought they were going to lose. I saw a lot of predictions saying OSU would win by 1 or 2. You were the only person I saw that thought they would win easily. Great prediction. Looking forward to your prediction this week. For me, the coolest aspect of The Game was watching the Buckeye defense come out in a traditional base 4-3 defensive scheme. Told the couple in front of us, and anyone else with-in earshot that _ichigan was about to get blasted. The most confident response was……..we can only hope! Another guy about my age said, they might get a narrow win, but elephants would fly before the Buckeye’s blew this team out. He was the first person who hugged me even before the final gun sounded. I was like you. I was telling people, if OSU were to lose, it would be close. But when they win, it was going to be by multiple TDs. Harbaugh has run the same offense every where he goes and does little to change it. That gives an edge to the OSU defense. And as we all saw, there were no adjustments by Harbaugh at halftime. It was an awesome win.